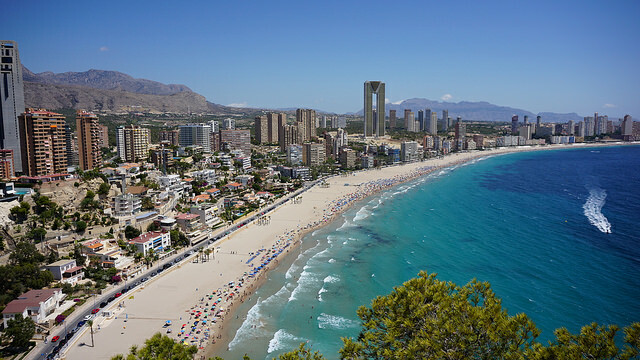 Benidorm might not be everybody’s cup of tea but if you’re looking for all the attractions of a large scale resort then go there as there are none better. Five million visitors can’t be wrong. It’s a common myth that Benidorm is nothing but a load of British pubs attracting thousands of rowdy lager louts. Not true. Benidorm attracts visitors from all over Europe and is an extremely family orientated resort with something for everyone. In fact the most common language you’ll hear as you wander the streets is Spanish as the resort caters well for its own people. Tourism dates back to the early 1960s when Benidorm was no more than a small fishing port centred on a domed church next to Plaza del Castillo. Today Plaza del Castillo is called Placa del Castell thanks to the growth of the Valencian language but the same old church remains on its rocky peninsula surrounded by an unbelievable number of hotels, apartment blocks, bars and restaurants that a visitor could be forgiven for believing they were in Las Vegas rather than on the coast of Spain. The tallest building is the Gran Hotel Bali at 186 metres. Protected by the Sierra Helada mountains the Benidorm climate is mild and sunny all year round. Winter daytime temperatures seldom fall below 10ºC and can in fact be high enough for sunbathing. At the height of summer in July and August average temperatures are around 30ºC but these can reach 40ºC in the middle of the afternoon. It also tends to be quite humid in the summer months. There is not much rainfall but what there is generally falls during the winter months. Fortunately even when it does rain you know that the sun is never far way. In the summer you would be very unlucky to experience more than a few drops of rain. The weather in Benidorm means that you can really enjoy the outdoor life both in summer and winter whether it is strolling along the promenade on Levante Beach, exploring the streets of the old town, visiting one of the Benidorm Theme Parks, sunbathing or even playing golf on one of the Costa Blanca golf courses. Below we have provided the current Benidorm weather forecast and the latest 4 day forecast. Below that again are two graphs showing average temperature and rain fall for each month of the year. Taxi Services: There are taxis at Alicante airport which can carry up to four people. There is a fixed rate to Benidorm, however, some drivers will start their meter early which is likely to increase the price. So you must confirm the price with the driver before departing and make sure that he’s not going to add on an airport supplement and a baggage supplement for each case you’re carrying. Shuttle Services: Without a doubt the most convenient option is to pre-book a shuttle transfer from Alicante to Benidorm. Prices are very reasonable and you’ll be taken to the door of your accommodation. Shared shuttle transfers are the cheapest option but private transfers can also be arranged. Having checked out the various suppliers we’ve found local travel agency, Shuttledirect, offer great deals. Alicante Airport Bus: There is an airport bus from the airport to Benidorm which leaves Alicante airport every hour on the hour from 8am until 5pm and then every two hours until 11pm. The bus departs from outside the arrivals terminal and you pay as you get on the bus at the airport. Just look for the “Benidorm Bus” sign as you walk out of arrivals. For the return journey this same airport bus departs from Avda. Europa in Benidorm on the hour every hour from 7am until 4pm and then every two hours until 10pm. You should pay for this service in the office in Benidorm. It’s not a bad idea to buy your return ticket as you arrive in Benidorm as the bus gets very busy. To be sure of the latest timetables and prices check the Alsa website. This is far from an ideal option as the bus is generally packed and is extremely inconvenient if carrying more than hand luggage or if you’re travelling with children. The arrival point in Benidorm is also likely to be a long way from where you’re staying. Train Services: Please note that there are no trains operating directly from the airport. If you don’t mind heading into the city of Alicante you can get the L-1 TRAM service which runs up and down the coast as far as Dénia. Having made your way into Alicante the journey to Benidorm then takes around 70 minutes. Clearly not the most convenient option! Distance: 140 Km / Estimated Transfer Time: 1 Hour 30 Minutes. Distance: 158 Km / Estimated Transfer Time: 1 Hour 30 Minutes. 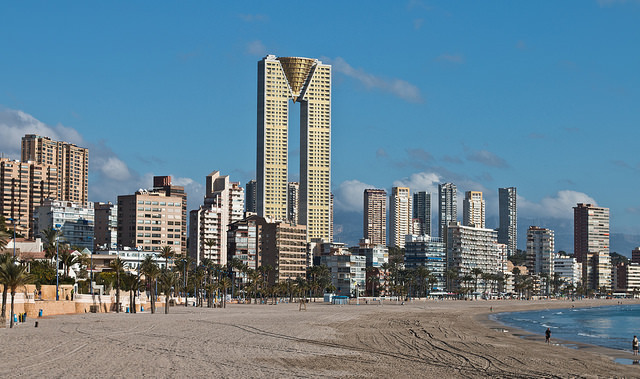 With around 5 million annual visitors there’s a vast selection of places to stay in Benidorm. In fact Benidorm is 3rd to London and Paris in terms of number of beds on offer in the whole of Europe. Whilst many tourists book package holidays to one of the many hotels in the resort there are plenty people who prefer to take the self-catering option. There are many apartments with shared swimming pools for rent in Benidorm which offer an economical holiday option. If you’re looking for something a little more upmarket you’ll find that there aren’t many villas for rent in downtown Benidorm although there are some lovely places within a few kilometers if you don’t mind driving in and out of the resort. Take a look at Booking.com for a wide range of accommodation options. No matter which type of accommodation you decide to go for you should bear in mind that the Playa Levante area is where most of the bars and restaurants are while the Playa Poniente area is where many Spaniards and families tend to stay. The following street map of Benidorm is taken from Google Maps. Simply drag the map around to find where you want to be and zoom in or out accordingly. If you go to the maximum zoom you will enter ‘Google Street View’ which is a photographic tour of the resort. If you’re trying to get your bearings just find the old church of San Jaime which is an ideal spot from which to describe the geography of Benidorm as it is the heart of the old town which splits the resort into two parts. To the north is Playa Levante, a 2km long beach of golden sand with restricted traffic access along the promenade and the livelier of the resort’s two main beaches. To the south of the old town is Playa Poniente which is 3km in length, also has golden sand but is narrower with far fewer hotels and a road separating them from the beach. Benidorm is a holiday paradise for children. First of all there is the fantastic beach which will keep them amused for hours. Climbing frames are set up in several places near the back of the beach and there are trips across to Benidorm Island on a glass bottom boat or submarine. Next there are some fabulous theme parks which are hugely popular with children of all ages. Terra Mitica has some of the best rides of any park in Europe whilst next door is Terra Natura, a kind of zoo/safari park with a great waterslide area. 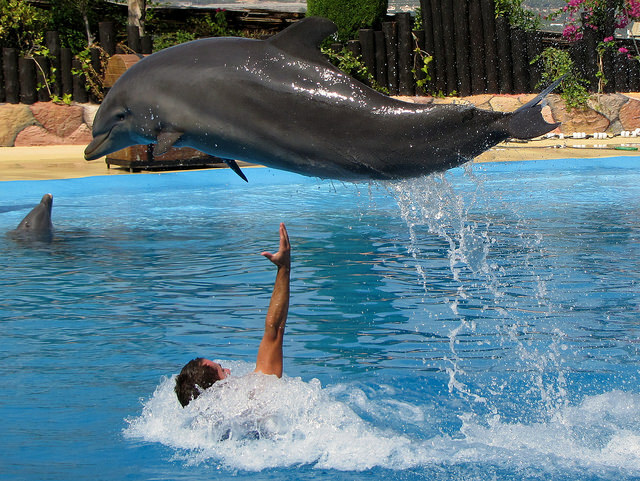 Mundomar is an aquatic animal park where the dolphin shows are the highlight and Aqualandia next to it is Europe’s largest water park. Other child friendly activities include the Medieval Evening where the children enjoy the horse shows whilst the parents tuck into dinner and wine. There is also a funfair and mini-golf which is great for young children along Avenida Mediterraneo and there’s a ten pin bowling alley next door. Many of the bars are well aware of the importance of looking after the children and provide some great entertainment that the kids love. Pancho’s is great for younger children where Captain Britain plays games with them such as musical chairs. Older children will enjoy the hypnotist who often follows. Unfortunately, a perennial favourite, Phil the Clown is no longer with us. In the Cellar Bar Louie the Clown is brilliant with the kids. He gets them participating in all kinds of party games and dances then does competitions in which they win sweets as prizes. Be prepared to be dragged up with your child for the competitions. After the clown show there’s usually more child friendly entertainment such as a dog show or magic show which is great for all the family. Many bars show afternoon films which coincide with happy hour so just keep your eye open for what’s on on the billboards outside bars. The karaoke at Churchill’s is another popular event for all ages. Whilst many adults will enjoy the theme parks there’s also a great range of nightlife on offer with countless pubs, Benidorm restaurants, nightclubs and a variety of entertainment. Benidorm Palace is the premier entertainment venue with spectacular shows all year round. A very popular week outside the main tourist season is during the Benidorm Fiestas in November when residents and holidaymakers get together for an enormous party which attracts many visitors year after year. As the owner of Spanish-Fiestas.com I’ve travelled to pretty much everywhere in Spain so I’m familiar with what the brochures call “the Real Spain”. I had low expectations when going to Benidorm for a week to prepare this section of our website but was completely wrong. I really enjoyed the place and highly recommend holidays in Benidorm for single people and families as well as to retired people who make up the majority of the foreign population during the winter months when some long stay bargains are on offer.